My great aunt, Mamie, was in charge of collards in my family. No one, and I mean, no one, cooked collards but Mamie. It was a daylong process. Picking the collards, soaking them in salt water to remove any lingering insects, washing them, cutting out the core, cooking in ham hocks for at least 3 hours, chopping the collards, and finally extracting the potlikker. It was laborious, so I often chuckle when I see packaged collared all washed and chopped in the grocery. Mamie would have never allowed anyone to chop before cooking. I own a gigantic Wagner Ware roaster that is the size of child's coffin. I drag it out about three times a year. Turkey for Thanksgiving and possibly Christmas and for a batch of Brunswick stew. The other day I ran across a sale on pre-washed, pre-chopped, pre-packaged collards and thought I would give them a try. 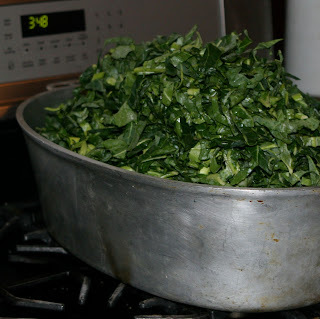 Raw collards take up quite a bit of room, so I dragged out the Wagner Ware and set off on my collard adventure. Needless to say, I have collards to freeze and potlikker for all kinds of endeavors. The Lee Bros. tell a wonderful story about having company for a wedding or some large event and one of the guest, a Yankee, no doubt, threw out the potlikker that the boys were planning to use to poach eggs. Yes, indeed, potlikker poached eggs are a great delicacy. I love to eat anything that remotely resembles eggs Benedict. Here is a great way to use potlikker and leftover cornbread to make an unusual Benedict. Cut a round of cornbread. Heat the potlikker in a shallow pan until just under boiling and poach an egg. 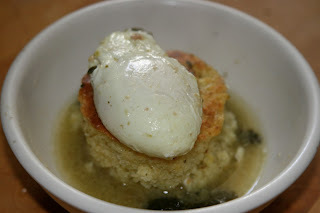 Place the poached egg on top of the cornbread and cover with potlikker and a few collards. If you wanted an a creamy sauce, add a bit of cream to the poaching liquid and reduce. Need other potlikker ideas? Check these out. oh my...with vinegar pepper sauce and turnips! Have heard about the potlikker before but now, I think, it is probably loaded with health benefits. I'm growing collards in a windowbox; they are doing well and I can't wait to cook them like you said.